I’d like to add something to that list, particularly as it relates to combat. It is: “Run a simulation”. Ok, so think about this. If you play with a regular group, you already know what classes, play styles and powers will be present. You know how they work together and what types of synergies will exist. You also know what the terrain will look like and how that will effect the capabilities of your players and monsters. 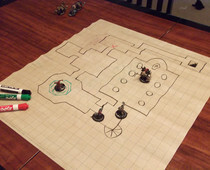 You likely have already prepped the maps, either by drawing on a battle mat, arranging some dungeon tiles or simply using an existing poster map. Since you already have the maps, simply throw a few tokens down and look at them. Read through the monster powers as you look at the map. Think about what the monsters might try to achieve in the first round or two of combat. Then, write down a couple of bullet points for the first rounds. Here’s a few from a recent combat that I ran a sim for. 1. Monster A has a recharge when bloodied so remember to use it right away so as not to waste it. 2. Monster B gets combat advantage in Rd 1 so make sure he gets an attack off against a weaker character. 3. Monster C has weak AC so he would likely take cover behind the perceived toughguy of his group. I personally write these on a post it note and stick it to the page where I have my combat notes (in my binder or on the page of a published module). You could easily put a “tactics” note in most any electronic combat tracker. In practice, on game night, I simply read my post-it note as we roll initiative. A couple of quick bullet points and I remember exactly what I wanted to achieve. This is in contrast to trying to read a paragraph or two of tactics and then scouring through the monster stat blocks trying to make sure I don’t miss anything. Another tip I’ve read is to focus on one cool thing for each monster. Just one. In my case, I’d highlight that line of the stat block with a pink highlighter. My one goal would be to successfully unload that power in combat, to really RP it up and make it special. Then you move on. Odds are good an enemy will only get one really good opportunity to act anyway. If you have a grand plan for a monster, he may just end up dying before you can execute it, or worse, he’ll survive and cause combat to break into hours instead of minutes as you try to make every move an epic masterpiece. So to sum it up, during your prep, run a quick sim of the combat. Ten minutes tops. Do it while you’ve got your maps out. Take some quick notes that you can read on game night, then forget about it. On game night, open your combat up, roll initiative and thank yourself for making your life easier and your game more enjoyable. Personally I find that rehearsing leads to more DM frustration than is ultimately necessary. Players are all chaotic, despite whatever their alignments are and they will rarely conform to any previous expectations. I had one player randomly decide to desecrate a grave and keep the finger bones of the corpse as a trophy – and the grave itself was simply “dungeon dressing” and not really meant to add anything but a little atmosphere. Hey, thanks for commenting! I think you make a valid point. Any prep above and beyond the bare minimum can lead to frustration if the players do a direction you didn’t expect. My thinking with this post was simply to address Amerons experience that a rehearsal made his games run smoother. I definitely think any rehearsal or “sim” thinking should be kept short and focused, at most, leading to a couple of bullet points to look at on game night for guidance when things can get hectic.